Reduces pressure and provides extra support for entire body. Provides comfort and effective pressure redistribution. 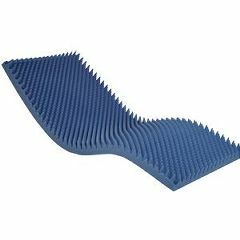 Joerns Healthcare BioClinic Therapad Eggcrate Overlay is puncture-proof pad that has open cell material, wave cut construction and provides greater support while dissipating heat and moisture better than fluff or mechanized pads. It utilizes more of the body to distribute weight and is made of standard density foam.